Come in and grab the perfect gift for Dad. While you’re at it, get yourself something, too! The 115th Anniversary Celebration comes once in a lifetime, stop in to get Dad geared up with 115th Anniversary apparel and collectible gift items! **30% off in-stock HD 115th Anniversary apparel and 115th Anniversary general merchandise. While supplies last. Limited time only. 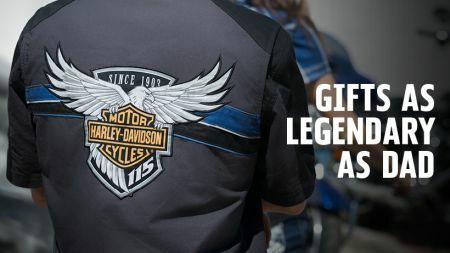 **Valid for in-dealership use in connection with the purchase of men’s and woman’s 115th Anniversary apparel and 115th Anniversary parts & accessories. Excludes 115th Anniversary Rally Packs and licensed product. Valid from June 15, 2018 – June 17, 2018 at participating U.S. dealerships. Offer not valid on previously purchased merchandise. Cannot be combined with any other offer, discount or promotion. Offer is subject to change without notice. Void where prohibited or restricted by law.